Wanna play Keepie uppie on your iPhone juggling a virtual football? ARSoccer has been around for a long time and today it has gone free. It’s an augmented reality iPhone game involving soccer. You see a virtual ball on the screen. 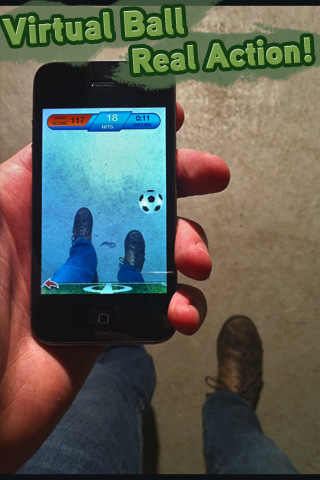 While pointing your iPhone towards the ground, the camera shows you your feet and the virtual ball. Kick it using your feet and the ball moves around as if you had kicked the real thing. Keep juggling the ball repeatedly to keep it up. The idea is brilliant and it actually works too. A couple of things you have to keep in mind. It works best if you are standing over a solid colored background, preferably white, otherwise it can feel sort of glitchy and unresponsive. Let me warn you about one thing. Do this in a private setting. You might look pretty weird standing there in public kicking your feet up in the air. I’m not sure how much this game will help improve your hacky sack or soccer skills in the real world, but it’s pretty fun and heck you’ll even burn some calories while playing, which is remincent of motion based games like Wii Fit and Kinect for Xbox 360. Overall, this is like a must “try” game, especially now that it’s free (for the time being). It used to sell for $1.99 before. Works with iPhones (3G, 3GS, 4G) and new iPod touch (4G) running iOS4. AppSafari review of ARSoccer – Augmented Reality Soccer Game was written by Joe Seifi on February 1st, 2011 and categorized under App Store, Augmented Reality, Free, Fun. Page viewed 5549 times, 1 so far today. Need help on using these apps? Please read the Help Page.